The idiots who ru(i)n this country have been emitting wind and hot air for so long, it is hardly surprising that they have fallen for this grotesque idiocy! I just wonder how much it will cost to clear up the wrecked wind factories in twenty years. Chris, you've got this entirely wrong. 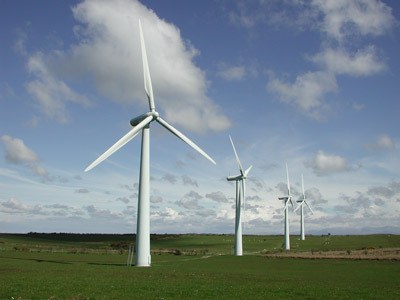 Vestas make onshore turbines; notably 1.5MW and 3MW models. Siemens, GE and Gamesa are coming to the UK to build offshore turbines, which range from 6-10MW. Vestas doesn't yet have a player in this market, so isn't coming on board. Demand for wind and other renewables is still being driven less by environmental concerns than the very hard-headed realisation that it constitutes a useful hedge against rising gas prices. You know, as happens whenever Russia feels like Europe isn't paying it enough attention. As such, the economic downturn and the resultant lower commodity prices have decreased demand for renewables - but as soon as the economy picks up again that demand will return, most likely in 2013-4. When it comes to wind power Saul Griffith is the man to listen to, he is the man behind Makani power. I remember him talking about having to put wind turbines way up high to make best use of them, which is why I suppose he has came up with this kites tap wind energy. The man is a genius & should be listened to when it comes to the realities of using green power, he is a matter of fact type person who, although doesn't ever really want to buy another car to help do his bit for the environment & has an office in a no longer used x military airbase, thinks saving polar bears from the climate change needs not be considered. If you’re into green issues & have never seen Saul Griffith: Climate Change Recalculated you’ve missed a treat. Never mind the Bell comments, wind turbines are still inefficient wherever you put them. The rated capacity is a joke. They will not make up for any loss in conventional generating systems. And people are beginning to realise. If it were not for the huge subsidies hidden in our energy bills they would not exist. These taxes should by right be itemised on all bills, as VAT is. I would say that the government's record on winner picking is less a result of the supply of further money available and more that it isn't the ministers that stand to lose something. The update is interesting, but even if correct I still don't think it's the job of government to provide seed capital for these guys. If generators want to buy turbines then great fantastic do it. I don't see why taxpayers should have to build the factories when they are also going to be the ones buying the electricity that comes out at the other end. "I don't see why taxpayers should have to build the factories when they are also going to be the ones buying the electricity that comes out at the other end." I think that it's because governments see jobs as a benefit, not a cost. But that is, of course, because they are primarily politicians and not driven by such sensible things as economics. Adam Bell. You seem to be missing the point - wind turbines whether onshore or offshore are useless and will contribute little towards energy security. Wind turbines generate electricity using huge magnets, the raw materials for which are completely controlled by the Chinese. I've seen two different estimates, but China controls the supply of between 90 - 95% of rare earth metals which are needed to make these magnets. We've seen them getting stroppy already with the USA for the supply of resources so I wouldn't like to depend on them for a secure supply of anything. If energy security is high on the agenda for power production, we should be investing in natural gas exploration in the North Sea (shale extraction) moving into the latest generation of nuclear. Wind power endangers energy security if anything. The investment in green manufacturing of this sort is political only and the price we have to pay for letting a fool like Huhne loose on decision making. Most of these windfarms are just vanity projects and the money would have been better off spent improving the technology for power production and storage. I would love to see renewables as our main source of energy but the current technology just won't cut it. Here's a link to a book why explains why this is the case and should be mandatory reading for anybody interested in the future of energy production. P.S I am not the author! The world’s oil will be all but gone by the end of the century, as a major contributor to global warming it looks like those who want an end to the use of fossil fuels will get their way, there is however a problem with that, a very big problem with that, we rely on fossil fuel for almost everything we do, what are the alternatives to not using fossil fuel? Solar, wind, wave, bio, nuclear, fusion & more! Let’s look at some figures as to get our head around what we are trying to achieve. The average person uses around 2.2 KW as they go about their life, an average American uses over 11KW, that takes the worlds global energy consumption to 13 terra watts or put another way, 13 million, million watts. As the governments of the world are always telling us to be fair, I think the example I have from Dr Saul Griffith & Brian Cox is rather fitting! Let’s say we want to give each person on the planet 5KW by 2035 to use as they go about their lives, doesn’t sound too much does it? Sounds fair & we have 25 years to achieve it, but can we do it without fossil fuel? If we have 6 billion people on the planet each using 5KW of power that comes to 30 terra watts of global consumption, can we mix & match energies to make up the power? For the major chunk of the power we would need 5,000 nuclear reactors, that’s two & a half full size reactors to be built each week for the next 25 years. You would need to build & install a full size 3 mega watt wind turbine every 3 minutes for the next 25 years (& not forgetting the land to put them on). What about solar to raise 10 terra watts, you would need 250 sq metres of solar cells to be put up every second for the next 25 years. What about Bio fuel, 2 terra watts. You would need 4 Olympic size swimming pools filled with genetically modified bacteria to be built every second. The amounts above don’t take into consideration a population increase. Alternatives to oil are out there, but as we can see we should be building all those things now, as were not, what are we going to do about the oil running out? What are we going to do about sharing the power around the world, because trying to raise the power needed for everyone to have a fair share is an almost impossible task. Our saviour could be fusion power, sounds like science fiction but we are getting quite close to engineering a machine that can produce fusion power, that closeness can’t come soon enough, but most seem to be hoping within 50 years. wind power is useless because it is not dispatchable. as long as folks expect something to happen when they flick a switch, wind power will be only a toy for politicians. however, them politicians are so hell bent on driving us back to the preindustrial era that the wind turbines might come usfeul to the elites in order to keep their high profile lifestyle, while the rest of us will be back to a stage where our days will be spent looking for food and energy. even if costs of energy produced with wind will become competitive with coal or gas, it still will be unpredictable. try to run any factory, with the power coming and going. As we can see from some of the figures above using alternative energy sources like wind & solar may seem like a nice way to power ourselves but creating the amount of energy we need for us all to survive is almost insane, there seems to be only one real hope & that is fusion, the best thing about fusion power is that it doesn’t produce carbon dioxide & so no global warming, not that the oil running out won’t help with that anyhow! Our future is dependant on developing fusion power. This will take a massive effort by many countries around the world & has already been ongoing for a good few years now, the experts seem to think we aren’t too far away from getting the engineering right that will allow us to do this. We know the science of it works, so “all” it seems we have to do is get the engineering right. Although that trips of the tongue what we as human beings would have achieved by creating such a machine will be the greatest engineering feat ever. From what I understand we have two main ways to make fusion power, the first is nuclear fusion at NIF, using 5 hundred trillion watt laser beams & we should know by around 2011 if laser fusion is possible, if not they will look to prototype fusion reactors that extract energy from stable plasma at the national fusion research centre, but if that doesn’t work then we could be in real trouble! The sad thing is that we spend more on ring tones than we invest in fusion. There is a lot of science involved with lighting a star on earth to create fusion but its nice to know that IF we can get fusion power to work not only are our energy worries over but so are the worries about global warming. "using 5 hundred trillion watt laser beams"
how many wind farm would take to power that stuff? we are at least 50 years away from fusion, and could be even longer. in the meanwhile, if we keep chasing this pie-in-the-sky dream of renewables, we will run out of money and energy long before we manage to achieve self-sustained, power producing fusion. Makes you independent of natural gas? How wrong can you be? As we have no significant hydro, you have to construct fossil fuelled standby plant at 90% of the rated maximum power for the windmills. The cheapest is a CCGT. So, because the maximum expected capacity factor of the windmills is 31%, you have to use natural gas for 69% of your electricity. So, the windmills lock you into natural gas. This is the lesson we need to bang into the head of the useless politicos in charge of energy. The Germans and Danes are giving up on wind because it does not reduce CO2 more than about 5% [because the thermodynamic efficiency of the standby plant is reduced by the need for continual cycling]. The British isles are rich in thorium. I’d like to look at another savoir, permaculture, that sounds like some hippy type of garden farming but it has some real benefits & a quick look at some figures shows how. We have three ways of doing farming, drudgery, throw fossil fuel at it or we use permaculture. A garden forest (permaculture) can have a high yield, a garden forest working at maximum yield can feed 10 people per acre & that is double the amount we can feed from an average acre of arable farmland now. A vegetable garden with an experienced gardener can produce up to five times more food per metre than a large farm, these figures shouldn’t be ignored. So we do have away forward, something we can do about oil & food shortages & one good thing, if you can call it that, is that global warming, as we know it, will become a thing we used to worry about! Phew! So how can I convince you of fusion & permaculture? To start with I need the help of Rebecca Hosking, the wildlife film maker & I will also need to give quotes from other experts in their field as I continue. Most, if not all of our farms are dependant on fossil fuels. The energy crisis will likely bring about a revolution in farming & change our country side forever, this change will also affect what we eat & where it comes from. The problem to start with for many people will be how much hard work farming normally is, farmers children in many cases are encouraged to get out of the hard farming life. That may be why the average age of a farmer is now around 60 & there are only about 50,000 of them left. Just looking at that figure must make us think we have neglected farming & farmers for too long, the thing, is if we don’t get back into farming we will be dependant on imports that, as the oil runs out, will be more expensive & harder to source. Oil expert Dr Colin Campbell says, “despite searching the world with all the modern technology we have at our disposal we are finding less & less oil, we have been using more oil than we have found since 1981 & so are now just sucking down into our inheritance”. You can always find experts that will argue about nearing to the date & peak of oil production but there is no serious doubt we are getting close to a turning point for mankind, sounds dramatic, but when we reach that peak we are on a down hill slope, there is a date that some believe oil will start to dry up & that is 2013. The oil decline means fuel shortages & prolonged economic turmoil. The impacts could be disastrous, it can even lead to war. At the moment if we didn’t have oil we would starve, even your humble sandwich takes large amounts of oil to produce it, from the farmer sowing the seed & using his tractor to harvest, to the plastic wrapping that wraps around your loaf. Apart from transport like cars, trucks & aeroplanes agriculture is the most fossil fuel intensive industry, when we look at the figures of how much calories to calories we need we see that it takes about 10 calories of fossil fuel to produce just one calorie of food, this can’t go on. I maybe wrong but I thought the whole thing about wind and other renewables is not that they take over from all other forms of generation, but that they add to it. So on nice sunny/windy days we use less gas and coal. Government interference does not work in as it twists everything out of kilter. Be it by forcing customers to pay an extra renewable tax or by paying above market rates to individual generators for their feedins. So you get stupid situations where you could end up with someone shining arc lights on solar panels and actually ending up in profit. Adam Bell: "Demand for wind and other renewables is still being driven less by environmental concerns than the very hard-headed realisation that it constitutes a useful hedge against rising gas prices." To start with there are no environmental concerns. The only serious concerns there are centre on loss of face. The control freaks hitched their wagon to a fantasy, CAGW, in order to grow the state. Now it's crumbling around them. But all hell will freeze over before they admit they wrong. If they have to permanently tear the guts out of Western economies that will be done without even a second glance. Once the state juggernaut gathers momentum it will take more than sweet reason to bring it to a halt in less than decades. They will happily pervert the minds of whole generations of school children in an effort to embed the big CAGW lie deep in their souls. Their propaganda outlets will maintain the steady drip, drip, wherever the opportunity arises so the lie becomes second nature. The entire climatic history of the world will be (and is being) rewritten as necessary, Stalinist fashion, to suit their requirements. And how can something that is demonstrably useless be a hedge against anything? Give me strength. Wind power (if it even merits the use of the word) is not available on demand and we cannot store it. If we had the terrain and the investment in hydro then maybe, but we don't have those things and we can't conjure up mountains and valleys and dams out of thin air, let alone the pumped water schemes. All the power in the world is of NO use unless it can be made available when there is demand either by being switched on at source or by cracking open a store of the stuff. As for the supposed 25% load factor, that has to coincide with peak demand during the day to be of much use, so maybe 10% to 20% would be a more realistic measure. And on top of that, you want it to be available at the time of the year when it's needed. In January and February the wind wasn't there, so the wretched junk didn't produce. The only thing the windmills can efficiently produce is economic ruination. Environmental? Not remotely, the very opposite, an environmental disaster, as anyone who has to live near them is all too well aware. @Scooper: You may wish to look up that noted leftie Tim Worstall on the subject of rare earths. They differ from gas inasmuch as they're much more equally distributed about the world - the reason for the Chinese stranglehold is that they're the only chaps with appropriate extraction facilities and sufficient disregard for the resultant pollution. We can rely on the market here, I would aver. On shale gas, I'm very much agnostic - the only reserve estimates I've seen tend to come from people who want lots of money for their lovely fracturing technology. I think this is a wait-and-see technology. @Alexander: You give figures of a share of generation of 31% wind to 69% gas. As an advocate of wind, I think this is rather generous to wind! There a few points to make. The first is that if you need to buy an expensive thing, buying something else that despite its initial high cost will eventually result in you using 25% less of that expensive thing is certainly a good deal. The second is that a lot of subtle investment is going into large-scale rapid-reaction biomass plants, providing us with one option for wind-shadowing following the end of natural gas. The second is that advocates of the third-generation nukes keep claiming they're rampable easily, which if true provides another option that'll save nuke fuel too. @Cerebus: Your points are largely covered above, but I would say that it doesn't necessarily matter when the wind blows under our current set-up, as we're already getting about a third of our baseload from rampable gas in any case. You still get the fuel savings, and you will up till when wind is taking up to about 30% of our capacity. Coincidentally, that's the amount we're talking about building. we did windmills 200 years ago. When something better came along we jumped at the chance. What I find interesting is the general assumption here that, other than fossil fuel and windmills (which are a joke), salvation lies in developing fusion reactors. Yet there is another source of virtually limitless power which no-one appears to have heard of. And the very reason that no-one has heard of it is because governments have kept mighty quiet about it and it has never been mentioned when the future of energy is discussed publicly. I am referring of course to thorium. Thorium is much more abundant than uranium and every ounce of it can be used in reactors, unlike uranium which requires enrichment. One ton of thorium is equivalent to 3.5 million tons of coal in terms of energy produced. Thorium reactors produce a tiny fraction of the by products of uranium reactors and do not present the huge difficulties of storage for many thousands of years because their half lives are measured in tens of years. Compared with uranium, thorium reactors can be designed to be inherently safe, free from the danger of meltdown, or even operate in a sub-critical state using an accelerator. Thorium reactors can even be used to efficiently rid us of plutonium. The advantages of thorium are so great when you start to look at them that this has to be the power source of the century if it can surmount the obstacles which currently bar the way. There is one reason uranium has ruled the roost. Uranium reactors were the means by which governments could produce plutonium for nuclear weapons. Thorium is indeed the disregarded fission game changer, useless for bombs yet plentiful and cheap. Just what you dont want if you wish a return to the agrarian dark ages. Unless you see your self as a potential feudal aristocrat or priest. Shale gas has crashed the price of natural gas in the USA (look at the performance of the natural gas exchange traded fund), it isnt just snake oil salesmen selling fraccing techniques, it works and amazingly well. Should we believe that US geology is unique in its wealth of shale plays?. Watch the EU machine impede development of shale gas in Europe through tax ,regulation and eco crap at every turn. Its covered in the 'nohotair' blog in depth. I have been thinking more and more that if governments had not gone down the uranium route (for the weapons' material) and chosen thorium for power plants instead, we might not be where we are today, on the eco-fascist road to economic collapse. Thorium is potentially so much more practical than uranium as an energy source that the perfectly valid environmental concerns that prevented the wider tale-up of nuclear power would never have come to the fore. Alexander is right. Wind is unreliable and needs back up from CCGT, pumped storage or other. Offshore has an unproven reliability record and very poor payback even in good sites (and we have plenty of those around our coast). Marginal cost may be zero, but the initial capital cost is huge and the useful economic life not proven. Nuclear is the only serious option. 'Investment' in windmill manufacturing plants is a bit like the trains 'manufactured' in the UK, basically assembly of subcomponents. The returns on this capital don't get reinvested in the UK, they go straight back to the parent corporations, as does the intellectual property gained from development of these technologies. Rubbish deal.